VMware Horizon® 7 offers full-featured support for hosted applications and shared desktop sessions, expanding the capabilities of the leading virtual desktop infrastructure (VDI) platform. Tightly integrated with Microsoft Remote Desktop Services (RDS), Horizon can deliver hosted applications and desktop sessions, virtual desktops, and VMware ThinApp® virtualized applications, all supported on the devices end users want to use. 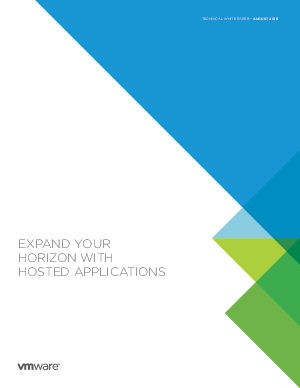 This white paper provides guidance for adding support for hosted applications and desktop sessions to your VMware Horizon infrastructure. Whether the goal is to integrate an existing RDS environment for combined management with VMware Horizon virtual desktops or deploy hosted applications and desktop sessions for the first time, VMware Horizon provides the technology required and a simple path forward.